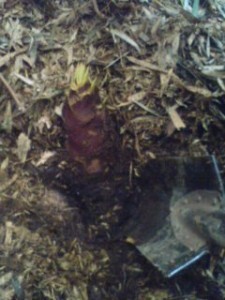 The roots of a bamboo shoot I had just dug up- with a little help! Bamboo grove in Onozaki, Tsukuba. Pleasing to the eye – as well as to the ear… clacking poly-rhythmically with each gentle breeze. 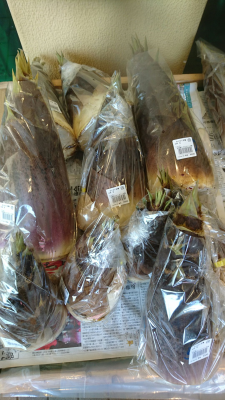 In April, bamboo shoots ( Take No Ko) hit the market across Japan, and become readily available even to those living in big cities, far from any actual bamboo groves. As these beloved symbols of the season are at their best in late April and May, the Japanese everywhere, look forward to enjoying them prepared in a variety of ways. I have been told by Japanese friends who have lived abroad in places with no bamboo, that they would daydream about eating Take No Ko when spring arrived. That is how much this food is connected with the season. 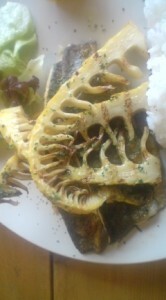 Those of us who live in Japan`s greener areas (such as Tsukuba), can look forward NOT only to savoring the Take No Ko`s distinctive flavor, aroma, and texture, but also to taking part in an important RITE OF SPRING- Take No Ko Hori ( 竹の子堀)- which means actually going out into the groves and digging up the shoots for yourself. My friend Sato-San, who every year presents me with the most savory boiled bamboo shoots I have ever tasted (country style, with big chunks of bamboo), told me of how when she was a girl growing up in Mase, Tsukuba, her father would dig up the fresh shoots while she and her brother would gather wood for a fire, which they got going just outside the bamboo grove. There , after peeling the bamboo, they would boil them for a couple of hours in a large pot with rice bran and chili peppers. The results of this process were most delicious indeed, a fact to which I can attest to ! 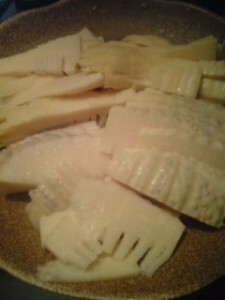 In fact, the cooking and eating of bamboo shoots right after they have been dug up, YABU-YAKI (藪焼き), has long been considered by connoissseurs to be THE only way of truly enjoying take no ko. After having learned this, I ALSO wanted to do some Take No Ko Hori and dig up some shoots for myself. I soon found out, however, that this was EASIER SAID THAN DONE! It was not finding the place to do the digging, locating suitable shoots or getting permission to do so which was difficult. It was the actual physical act of getting the shoots out of the ground which I found so extremely hard to master! Heading into one of Tsukuba`s many bamboo groves ( this one in Yatabe), with the landowner, a farmer in his seventies leading the way, I soon spotted dozens of shoots barely showing their heads ( the smaller and younger the better, is the rule when digging for take no ko). The farmer then handed me a special shovel, and told me to clear the dirt away from around the shoot. This I did only with some difficulty as the shovel was quite heavyfor me and the earth very hard. When I had managed to expose enough of the shoot, I was then instructed to attack it by getting the shovel deep down under its base so as to get the entire shoot. I was also told that this would best be done with the tip of the shoot leaning away from me. Using all my might, and even all my weight ( which is not insubstantial) by jumping up and down on top of the shovel`s blade while it was stuck in the ground, I just couldnt make much progress. I must have made for quite a ridicuous sight as well, a Woody Allen or Charlie Chaplin attempting to be a woodsman! The farmer, seemed to grow impatient ( or disgusted) with these lame efforts, and though of a much more advanced age than myself, he grabbed the shovel from me and got the shoot out within seconds. This course of events was repeated several times, with the farmer pointing out one delicious looking shoot after the other for me and insisting that I dig them up. Each time though he ended up doing the job for me. Finally,after having five shoots dug up for me, I told him that I was determined to get one for myself. Maybe because he just couldnt bear to watch anymore, or maybe just to take the pressure off, he left me,to face the shoot alone. I cleared the earth away, and struck the shovel deep into the earth hoping I had gotten under the base. Concentrating all of my strength ( and KI energy!) on lifting the shoot up out of the ground, I pressed down on the shovel handle , using it as a lever. Emitting a loud KIAI ( martial outs shout), I felt, with great relief, the shoot give way way and rise out of the soil. Almost in tears, I held the fruit of my efforts in my dirt stained hands. Exhausted, I breathed in the earthy smells of the grove and took in the sounds of the bamboo rustling in the wind. Saying a heartfelt thank you to the farmer for giving me the chance to have this unforgettable experience and carrying the heavy load of take no ko ( only one of which I had actually dug up myself !) I headed for home, my mouth starting to water in anticipation. The trouble was, the efforts involved in TAKE NO KO HORI had me so beat that when I got home, sat down, and turned on the cd player before starting to cook- I fell asleep! There are plenty of fresh bamboo shoots available at supermarkets, department store food sections and green grocers. If you ask, your friends or neighbors might also spare you a few freshly dug up shoots. Bamboo in its numerous varieties as found in Japan has always been an important material for making things – ranging from the most common everyday household implements to the most sublime crafts ( whisks for the tea ceremony, for example or bamboo flutes). 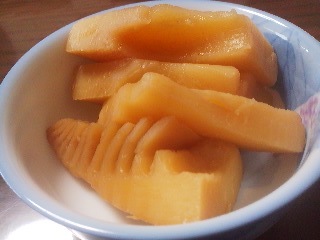 And though we know, because of the existance of certain poems and other references in classical Japanese literature, that the custom of eating bamboo shoots dates back many centuries, the variety that is most commonly eaten today- MO-SO-CHIKU (孟宗竹), did not exist grow on Japan`s main islands until about 250 year ago, when it was brought over from China, via the Ryukyu Islands ( Okinawa) first to Kagoshima. the most southern part of Kyushu Island. It reached the capital at Edo in the late 18th century ( 1774), when planted at the official residence of the Satsuma clan ( now Kagoshima) who had brought some up from their native province. After that this variety gradually spread northward, eventually reaching what is now Ibaraki. In fact, Southern Ibaraki Prefecture ( in which Tsukuba is located) represents the northen limit of where Mo-So-Chiku is commercially grown. 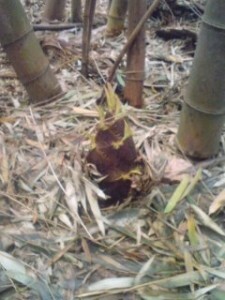 In central and northern Ibaraki, bamboo groves consist of another variety MATAKE. 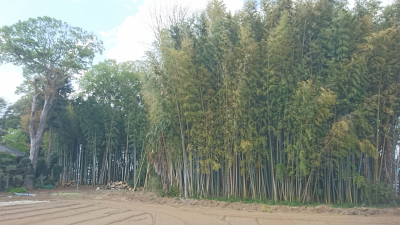 In fact, bamboo production DID become an important product in this area ( after having been long neglected) , though Nagatsuka Takashi passed away at a young age before he could see this happen. The Ishioka area now produces the most take no ko ( from mo-so-chiku) in the prefecture. 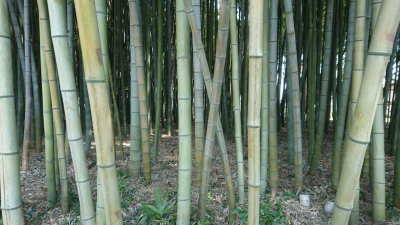 The Ami area was also once very famous for bamboo. In fact, in 1916, Ibaraki Prefecture established a Model Bamboo Grove in what is now Ami Town, in order to promote its cultivation. Besides being delicious and useful for making all sorts of things, the bamboo groves themselves are extremely beautiful and help create what we now consider a typical japanese landscape. The old groves of Edo, which survived until the mid 20th century in Tokyo`s Meguro area, are now sadly all gone, lost to development. 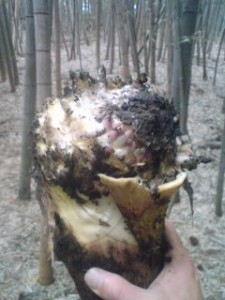 Lets hope that Tsukuba`s bamboo groves do not suffer the same fate. 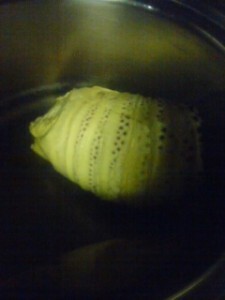 And… ready to eat- sliced, with soy sauce and wasabi- SUBLIME! Until I got to a certain age over forty, I was not fond of eating bamboo shoots or Soba, because the taste of those foods was too simple for my energy-pursuing tongue. Now I like to eat Bamboo Shoots and Soba very much because my brain has became more sophisticated for encounters with such delicate products of nature. I was born and raised mostly in Tokyo after WW2, and there were still many bamboo groves near my home in Nakano. 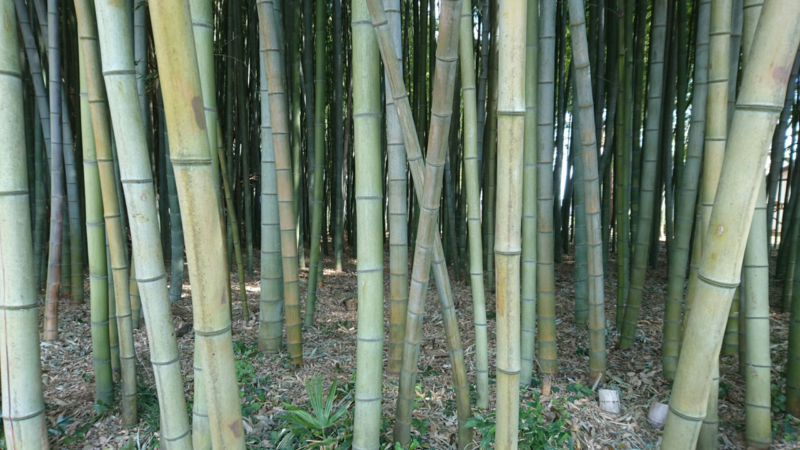 Boys used to play making swords, and bows and arrows from bamboo, cutting them with knives. They called the swords “Higo No Kami: Lord KUMAMOTO 肥後之守” ;which had a 6cm long blade. We were very accustomed to using such knives for sharpening pencils too. These are forbidden now because they are thought to be dangerous, and also it is possible that boys do not have the curiosity to use such equipment anymore!? Few city people are accustomed to using KUWA (hoes) for cultivating, or pitchforks. Only Gangsters in some places are accustomed to using shovels to bury materials they did not want to be discovered! Takenoko-hoes are very difficult for me to use, too. Like Avi-san said, Bamboo groves are something for Japanese,like the “call of the wild ” , and I realized the fact when I lived in Australia, and saw a Video for children called “Old tales of Japan : “Princess Kaguya, and “Home of Sparrow” it reminded me of bamboo groves back in Japan and filled my eyes with tears. 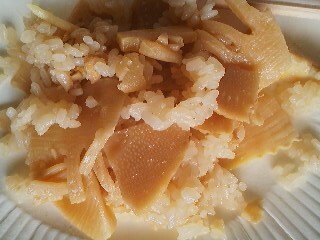 Maybe some visitors from Japan gave me a present of boiled and pickled bamboo shoots which I found very tasty, because at that time I became fond of bamboo shoots. I don’t know whether it was Mo-so-dake or Madake or Nemagari-dake ( the thin bamboo with bent roots, grown in northern Japan).